Below is a guest article that I wrote for the wonderful Network of Wellbeing, a not-for-profit organisation based in the UK which works to support the development of wellbeing on a local and global scale, both with individuals and communities. The original article was posted on the 9th July 2015 and can be viewed here. In this guest post independent researcher Emma Kidd reflects on the importance of being present and giving attention to our sensory experiences. Emma explains how this practice can offer a foundational step towards a strong sense of personal wellbeing. 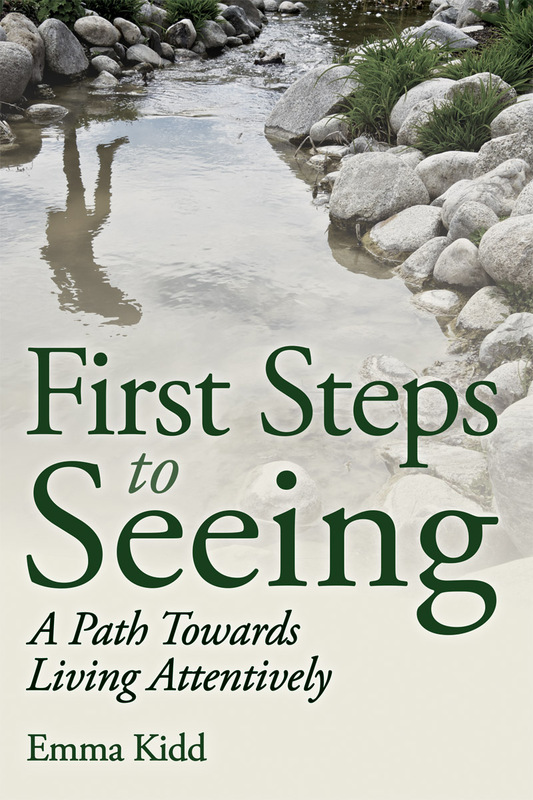 Emma, a Schumacher College graduate, has recently published a book on this topic entitled, First Steps to Seeing: A Path Towards Living Attentively. Whilst exploring my own experiences of life, and studying human experience through science and philosophy, I have come to understand that it is not only ‘what’ we do that increases our sense of wellbeing, but also ‘how’ we arebeing when we are doing something. 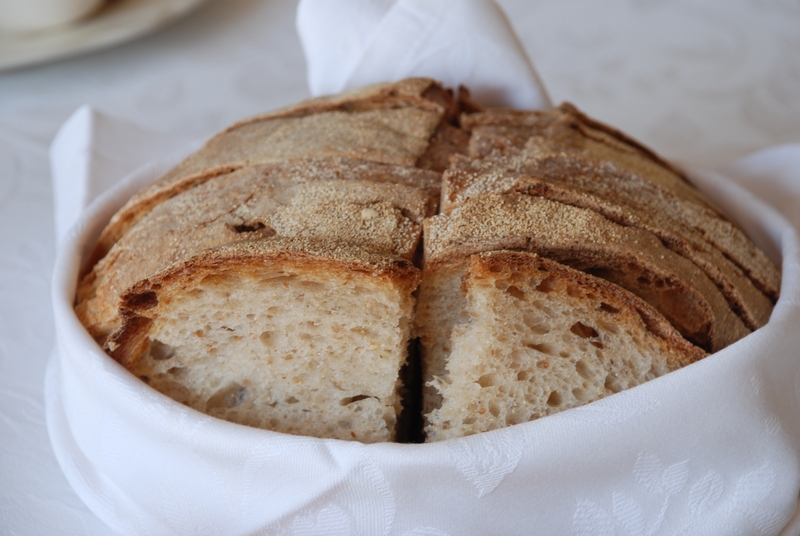 This is equally important whether we are engaged in a simple daily act of, for example, eating an amazing piece of home-baked bread with local butter lavishly spread on top, or whether we are engrossed in more complex tasks, involving thinking, speaking or working. For instance, to experience a feeling of enjoyment and satisfaction whilst eating – which can contribute to a broader sense of wellbeing – it is not enough to just carry out the act of eating food; we can go a step further and give our attention to our sensory experience whilst we are eating. We might think that carrying out the act of eating would automatically draw our attention tothe experience of eating. However, unfortunately this is often not the case. One of the reasons for this is that, in everyday life, our attention tends to be automatically drawn away from our sensory experience, and redirected towards a persistent stream of thoughts which pour into our awareness every waking moment of the day. On an average day, instead of noticing our sensory experience during daily actions, our attention usually gets transferred to whatever our mind believes to be ‘more important’, such as reviewing our agenda for the day ahead, rehearsing difficult conversations, or fretting about the fact that our partner left their wet towel on the bathroom floor yet again. This preoccupation with our thoughts then often leads us to spend our everyday lives in a kind of comatose state; a way of being which zones out from the world, either obsessing over the past or becoming fixated with the future. This stops us from paying attention to our experience of life in the present moment. However, we can change this at any moment by consciously bringing our attention back to our sensory experience. An everyday event such as eating breakfast, which is often ruled by monotony and constrained by our hectic schedules, is a particularly great opportunity to practice stepping out of this ‘automatic’ way of being. Whilst eating breakfast we will usually only be vaguely aware of what the bread tasted like or the fact that our cornflakes crunched as we chewed them, and we end up left with a hazy blur of experiences that our mind bundles into one event and labels it ‘eating breakfast’. However, as a result of intentionally paying full attention to the flavours, textures and forms with our senses whilst we are eating, we can allow our attention to focus on one experience at a time, and we therefore open ourselves to a much more satisfying encounter. Paying full attention to our own, or to other people’s, living experience of the world also allows us to become more fully aware of life, in terms of itself. Though it is not necessarily possible to be fully attentive at all times, consciously bringing yourself back to living attentively on a regular basis can be extremely beneficial. If we scale up this way of being attentive and apply it to broader aspects of living, such as personal or societal challenges, the deeper form of ‘living knowledge’ which emerges makes it possible for us to approach life with a more detailed, dynamic and authentic understanding of the challenges we are facing – which, in turn, organically informs us how to best proceed. Today, in the twenty-first century, we are confronted with a rapidly changing world full of social, economic and environmental uncertainties, and each of these does bring a myriad of challenges to our wellbeing. As we are all inherently connected to this changing world, if we wish to create the best possible conditions to thrive, we must develop an inner capacity to respond and adapt to life in new, creative and innovative ways. In my new book, First Steps to Seeing: A Path Towards Living Attentively, I offer a series of ‘stepping stones’ that help us develop the capacity to live life with full attention – to live attentively – and to thrive. These steps are delivered through a combination of personal stories, professional case-studies and practical exercises that are all related to everyday life. The intention of the book is to enable us to put the process of living attentively into action, straight away – no matter where we are, or what we are doing. I see paying full attention to life as the ‘bread and butter’ of wellbeing; it is the internal prerequisite to getting the most out of life – both as a cognitive tool which can increase personal satisfaction and wellbeing, and also as the most fundamental skill involved in getting to know the world ‘as it is’, and in context. By living attentively we can improve the ways in which we engage in our everyday tasks; we can more accurately get to know the subjects of our world, our work or our studies; and learn to be more sensitive and authentic in our interactions with other people, and with the world around us. In this way, living attentively can not only expand our own sense of wellbeing, but can also help us begin to see more possibilities for supporting others in the world to ‘be well’. And we can start putting this attentive way of being into practise with even the smallest of everyday acts, such as eating a piece of bread and butter. Emma Kidd is an educator, writer, independent researcher and consultant. Her practice is centred around leading living inquiries into how we can co-create a happy, healthy, and peaceful world. She works with educational charities, third sector organisations and businesses. Emma has a Masters degree from Schumacher College, UK, where she specialised in Phenomenology and the work of Henri Bortoft. This entry was posted in Uncategorized and tagged 5 ways to wellbeing, Environment, First Steps to Seeing, Floris Books, Goethean Sceience, Health, Living Attentively, Mental Health, mindfulness, Network of Wellbeing, neuroscience, Peace, phenomenology, Psychology, Resilience, Schumacher College, Self-Help, sensing life, Sensing_Life, Sensory perception, sustainability, wellbeing on July 14, 2015 by roseyenglishangel.